The sun is out, the snow is melting, and the first touch of green is tipping the trees. It must be spring! Aunt Annie invites kids and adults to celebrate with fun, easy Easter and spring-themed craft projects. Create a cute bunny or two to hop around your house, and chew on a carrot made of jelly beans. Learn how to make gorgeous marbled Easter eggs with a simple egg dyeing technique, cut bright bouquets of paper flowers, and share your spring cheer with easy handmade Easter cards for friends and family. Kids and adults will find projects ranging in difficulty from VERY EASY to AVERAGE. Some craft projects include simple patterns or templates. Pick a favorite, and get started! Fun Shaped Cards - Who says cards have to be rectangular? Learn how to make chick, bunny, and flower-shaped cards with a simple card craft project that will set your Easter cards apart! These cards are easy enough for younger kids and crafters with special needs. Easter Pennant Banner Friday Fun - Children will enjoy picking bright colors to make this decorative paper craft. Hang your Easter pennant in the entryway of your home, or mount it in your classroom for a lively touch of springtime cheer! Easter Suncatchers - Catch the springtime sun with an easy paper suncatcher project, including templates for black and white and colored versions. Besides being festive seasonal window decorations, your egg- or bunny-shaped suncatchers can be hung from an Easter basket, tucked into a handmade Easter card, or made into a mobile! The project includes coloring sheet patterns for toddlers and preschoolers. Jumping Origami Bunny Friday Fun - This funny bunny paper craft can be folded in just a few steps. Press down on his back to watch him "spring" up! The bunny	is a twist on the traditional origami leaping frog. Spring Paper Flower Bouquet - Don’t worry if the flowers in your garden aren’t ready for picking yet! Make an everlasting paper bouquet of daffodils, tulips and irises from computer paper, and tie them with a pretty ribbon. Give your paper flower crafts to someone you love, or decorate a gift with them! Washcloth Bunny Friday Fun - Whip a white washcloth into something sweeter with Aunt Annie’s quick and simple washcloth bunny project! Kids will love this little fabric rabbit that doubles as an Easter egg holder, and makes the perfect addition to any Easter basket. Stuffed Felt Animals - The project features stuffed felt animals—a chick and a bunny. Beginning sewers will use the overcast stitch to assemble the animals, while more experienced sewers can improvise with stitches and embellishments of their own choosing. Make them for all your Easter baskets! Jelly Bean Carrots Friday Fun - A sweet supplement to your Easter treat basket, jelly bean carrots are simple to make and fun to eat! Orange jelly beans, plastic wrap, and a little creativity help kids and grown-ups create this satisfying spring party favor. Peek-a-boo Easter Egg Friday Fun - Learn how to make a magical world inside an Easter egg with real eggshells, cutouts or stickers, and your imagination! Smaller crafters may need help snipping their eggs. Basic Egg Dyeing Friday Fun - Aunt Annie teaches you how to make a dye bath for brightly colored Easter eggs. Dye your eggs a solid color, or marble them for added oomph! 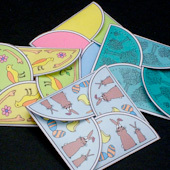 Easter Egg Holders - Cut out these printable patterns for charming Easter egg holders. This easy craft project requires nothing more than computer paper, scissors and a printer. Use the holders to display your decorated eggs or to liven up plain eggs. Simple Folded Bouquet - It’s never been easier to make a pocketful of posies for spring. No pattern is needed to craft this collection of delicate tissue paper flowers; just fold, cut, tape and glue! Your freestanding bouquet will make a great party decoration. Easter Chick Cards Friday Fun - Children of all ages will love using their hands as templates to create this cheerful Easter chick card. Trace kids’ hands to make the chick’s wings, and let their imaginations take flight. Marbled Eggs Friday Fun - Here’s a technique for making marbled eggs that requires no special materials, and produces beautiful results with very little effort. Half-Moon Petal Envelopes—Make these envelopes for Easter and spring. They are great for jewelry, gift cards and any other small item. 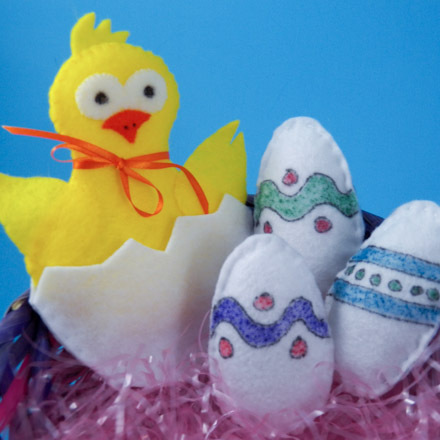 Project extra: Make stuffed eggs or a cracked eggshell to go with the Stuffed Felt Chick and Bunny using the templates in the Stuffed Felt Eggs pattern.